A perfect quick and easy dinner idea, these no-fuss, low calorie Asian-Style Pork Meatballs are just heavenly! Slightly sweet, slightly tangy, and a bit salty, the flavor combination works perfectly, and the end result in a juicy and mouthwatering meatball. Searing them in the sesame oil first, and then finishing them off in the oven helps to seal in the natural juices of the meat, and also adds a nice touch of sesame flavor. Serve this with toothpicks for an appetizer, or serve them over steamed rice and paired with a light cabbage salad for a complete meal. 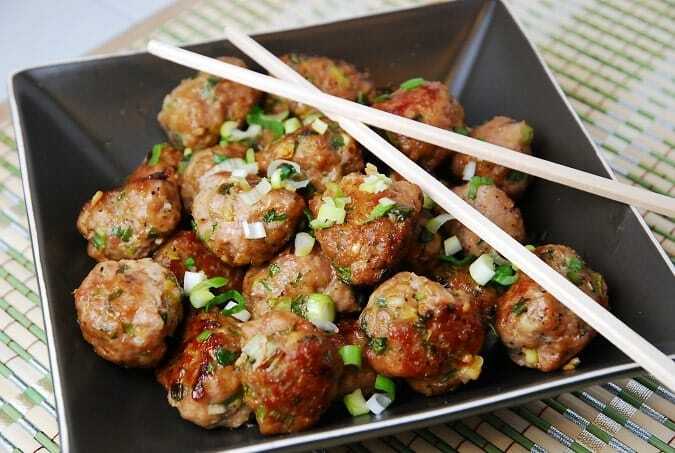 Juicy and incredibly flavorful, these Asian Style Pork Meatballs make a wonderful appetizer or a main course served with rice and a cabbage salad. Preheat oven to 400 degrees. Line a baking sheet with parchment paper and mist with non-fat cooking spray. Combine all ingredients (except the sesame oil) in a bowl, and mix well with hands. Form into 24 1 “ sized meatballs. Heat the sesame oil in a large skillet over medium high heat. Place meatballs in the pan, and brown evenly on all sides. Should take about 2 minutes per side. Transfer meatballs to prepared baking sheet, and place in oven for about 10-15 minutes, or until they are entirely cooked through. WOW!!!! I just made these for lunch tomorrow, and they are INCREDIBLE. My boyfriend couldn’t keep his hands off them and I had to box them up fast for there to be any left for lunch. It packs a wallop of flavor in a very unassuming looking little meatball. We’re already mentally adding these to the list of “what-to-bring” for gourmet dinners and Christmas festivities! Wanted to make this for my 2 young daughters. What could you substitute for the sriracha sauce? You could substitute a low sugar grape jelly…it works perfectly. i put this recipe into WW’s etools omitting the fish sauce and it still came up as 7 pts calculated at 4 servings. thanks so much for this recipe. i was looking for something to cook on a friday night and wanted it to be special but easy. heading to the grocery store right now!